The Novel: A Perfect Recipe, which teams a vast knowledge of literary technique with an understanding of the pleasures and pitfalls of writing. 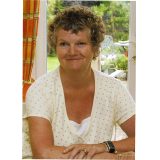 Drawing on her 15 years experience of teaching Creative Writing, Carolyn navigates writers through the various stages of novel writing, from creating characters and plots through to editing and how to make the correct approach to agents and publishers. Comprehensive advice, tips and practical exercises are offered at every turn. There are many good books on novel writing and you may feel that this is simply another one, no different from the rest. But I hope you'll find that this one is different – because what I've aimed to do with this book is to demystify the art of novel writing, to present it in bite-sized chunks, to make it achievable for new novelists. I can't teach you how to write, I can't give you that particular talent, but what I can offer is to guide you through the novel-writing process, to show you how to avoid the pitfalls, and to encourage you to complete a novel. I've taught creative writing for almost twenty years and this book contains some of the methods I've used with my students. In music and Art, there's an apprentiship, a long immersion, a perfecting of skills, and finding a level. But is there a similar apprentiship for a novelist? Carolyn's book is in the genre of accelerated apprentiship, specifically guidance for those writing their first novel. The presentation is lively, and everything about this book is refreshing and vibrant. The overall task is clear, as are the individual exercises. The text sparkles with erudition, good sense and experience. Carolyn herself says that there is no magic formula to writing a novel (possibly no perfect recipe either) but she shows us ways of seeing and noticing, ways of practising, ways to edit and take pride in our craft, ways of bringing it all together. And so here is the bonus, the extra that makes this book stand out: Carolyn is herself so actively engaged with living and with writing that her ideas (observation/life as a plot/character/stamina) enliven and enrich our thinking, and this can only be reflected for good in any consequent writing.